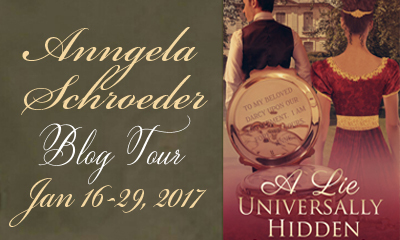 Today the Blog Tour for Anngela Schroeder's latest book, 'A Lie Universally Hidden', drops by for my review. Read on to find out more about the book and see what I thought of it! There are chances to find out more about the book on other stops of the tour, and the opportunity to win a copy too. Today I have news of an exciting project, which will be available for you to read later this year. You may be familiar with the name Christina Boyd. Even if you're not, you might well have read something she has contributed to. She's a book editor, and has edited many of my favourite Austenesque reads. Read on for more details! Today Brenda Webb is stopping by to share an excerpt of her latest 'Pride & Prejudice'-inspired book with us. 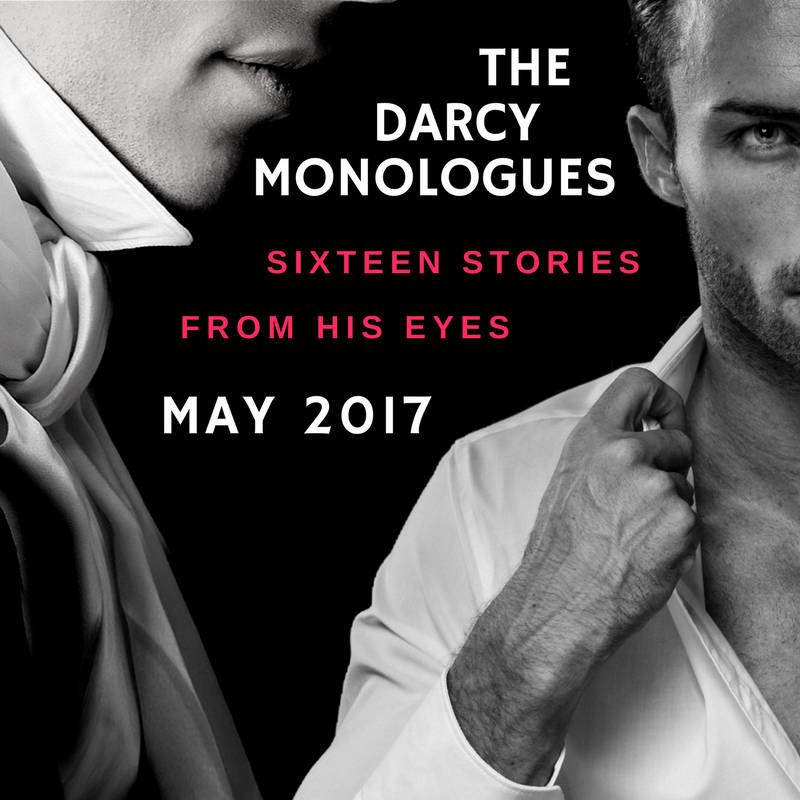 Brenda has written a number of P&P variations, 'Fitzwilliam Darcy: An Honourable Man', 'Mr Darcy's Forbidden Love', 'Darcy & Elizabeth: A Most Unlikely Couple' and 'Darcy & Elizabeth: A Promise Kept' in addition to posting on her Austenesque fanfiction forum DarcyandLizzy.com. Phew! Brenda's latest story is called 'Passages - A Pemberley Tale' and this, rather than beginning at a point within 'Pride & Prejudice' and diverging, instead takes a different turn before the events of canon, taking us on an entirely different journey. I'll now hand over to Brenda for the blurb and excerpt. 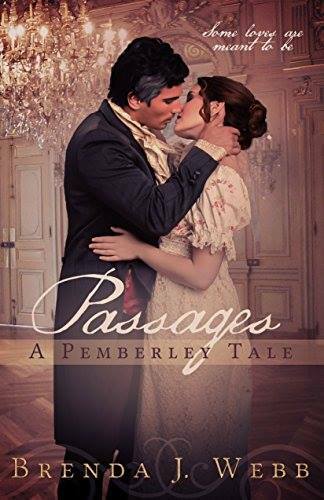 There is also a giveaway opportunity, as Brenda is kindly offering a kindle ebook of 'Passages - A Pemberley Tale' to two international commenters on this post, and a signed paperback of the story to a US/Canada winner. Happy New Year everybody! I hope you had a lovely Christmas, if you celebrate it. I had a nice time, with lots of time spent with my children. I also got some Austen-y goodies from Santa (I know one of them is Bronte, but still!). In the picture there is 'From Prada to Nada' which is based on S&S, the 1940 'Pride & Prejudice, which is the first adaptation of the book that I ever saw, so I am fond of it, plus the third DVD is the 1980s version of Jane Eyre featuring Timothy Dalton (yum!). The items on the lower half of the picture are some note cards featuring vintage covers of Austen's works, a little portrait of lovely Colin Firth as Mr Darcy, a Jane Austen pin and a trolley token saying I ♥ Darcy, in case I need reminding when I am buying food! Did you get any nice reading treats? I took some time off work and it was sorely needed, as I find everything hard to fit in around work and other commitments. I didn't get any reading done at all unfortunately but a new year is a new beginning! I always make resolutions, though how well they pan out is variable :) I would like to make sure I fit in some more reading and blogging time this year. I also intend to catch up on some of the reads that people have kindly gifted or sent me that I didn't manage to fit in previously. It's actually my blog birthday this month - I posted my very first post on 2 January 2014, although I didn't make the blog publicly viewable until about April, in case I didn't enjoy doing it. I should do something to celebrate it. Last year, I had a book giveaway, but I'm not sure what to do this time. What do you think? Is a book the best present or should I look out some Austen-related loot that people might like to win? I have a few visits lined up this month that I hope you will pop back for. Firstly, author Brenda Webb has a new book out, which is already receiving excellent reviews. In 'Passages - A Pemberley Tale' the characters of 'Pride & Prejudice' are taken along another path, as this story has taken a turn even before the events of P&P. Brenda will be stopping by soon with a guest post. Next, we have a new author that has written a number of excellent stories. I read her work on 'A Happy Assembly' but I don't know whether she posted on any of the other fanfic sites. I am happy say that she is publishing, and Amy D'Orazio will be dropping by with the blog tour of 'The Best Part of Love' which sees a widowed Elizabeth meeting up with Mr Darcy. Things aren't straightforward for our dear couple in this story! The blog tour for Anngela Schroeder's new book, 'A Lie Universally Hidden' stops by for my review. 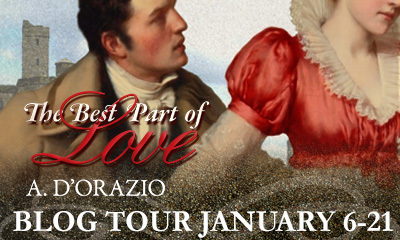 This book has both Darcy and Elizabeth already having a rival on the scene when they meet. You can see the cover reveal over at Just Jane 1813 today. And please, if you haven't already, check out my favourite reads of 2016. 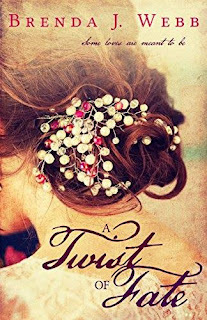 ETA: I forgot to say, if you'd like to have some company on your reading journey in 2017 you can join in the fun of Sophia Rose's Austenesque TBR Goodreads Group and if you're on Facebook, maybe you'd like to join us at Mr Darcy's Extensive Readers? Hopefully Mary hasn't succumbed and bought herself a copy. I will be in touch. Thank you so much to all of you who visited the post and commented, and of course, huge thanks to Victoria for visiting the blog and providing a giveaway.